Micromeritics Instrument Corporation, an industry leader in materials characterization, is pleased to announce the formation of its new Japan subsidiary headquartered in the Chiba prefecture. Micromeritics Japan G.K. was formed in March and has commenced commercial operations from its Chiba office located in Tokatsu Techno Plaza as of September 1. This subsidiary's primary goal is to deliver a superior level of service and customer support for Micromeritics' entire line of physical adsorption, chemisorption, high pressure sorption, density, porosimetry, and particle size instrumentation to its Japanese customers. 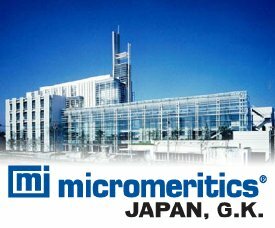 Chemisorption, high pressure sorption, and particle size product lines will be sold directly in Japan by Micromeritics Japan who will also be responsible for applications support and service. In addition, this subsidiary will provide support to Shimadzu Corporation, Kyoto, who will continue to represent Micromeritics porosimetry, physical absorption, and density products. "The establishment of Micromeritics Japan will provide service and support for our current customers, new customers, and Shimadzu Corporation's Testing Machines Business Unit. Due to our 40-year relationship with Shimadzu Corporation, Japan has a large installed base of Micromeritics instrumentation. Our subsidiary will help Micromeritics to build new customer relationships and strengthen established ones. We are enthusiastic about the prospect of working directly with our customers and providing Shimadzu with additional support. Micromeritics is committed to bringing an exceptional 'customer experience' to our Japanese market," according to Preston Hendrix, president of Micromeritics.